In the year 3000, an armada of destructive aliens has unleashed an all-out assault on Earth and is poised to conquer the planet. But when a young boy stumbles upon the crypt of King Arthur, the legendary monarch and the Knights of the Round Table are magically reincarnated. Together once again, King Arthur, Sir Lancelot, Merlin, and the rest of the classic knights take on the invading extraterrestrials and their wicked leader, Morgan Le Fay, the half-sister of Arthur. 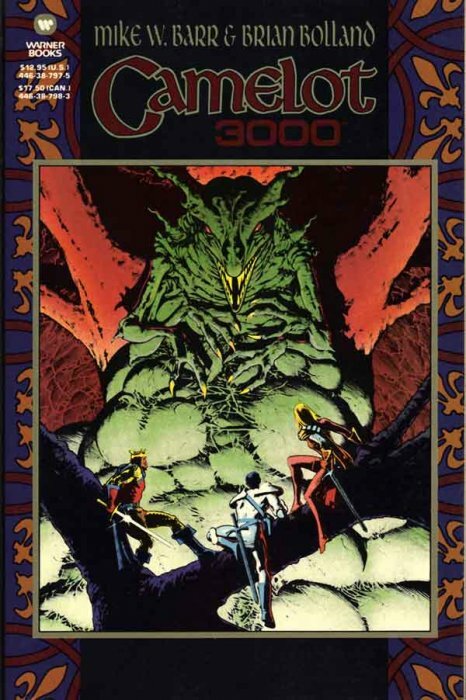 A mythical tale of honor and bravery, CAMELOT 3000 proves that some heroes are timeless. Over the course of my life, there have been many things I’ve taken a liking to. As should be of no surprise to anyone, comic books has always been one of those things. What may be only slightly more shocking is the fact that the legend of Arthur, King of the Britons is another. I’ve taken in just about every adaptation and version that’s come out through the years, even the musical Camelot. Not Spamalot, although I do have the official soundtrack. My friends and I can quote damn never every line from the Monty Python movie, and I’ve seen Excalibur, starring Nigel Terry, Helen Mirren, and Sir Patrick Stewart multiple times, and will even say that I may be one of the few who people who liked King Arthur starring Clive Owen and Keira Knightley. I was happy as hell to stumble onto The Last Legion (Collin Firth and Sir Ben Kingsley), having no idea at first that it was yet another tie in to the Arthurian legend. And so it just happens that today I was digging through some old books that I’d lost track of over the years, and ran across this gem. Released as a twelve issue limited series from 1982 to 1985, Camelot 3000 continues the story where Sir Thomas Mallory left off. King Arthur has been asleep all this time, and is awakened by Tom, a young man on the run from alien invaders in the year 3000. Having just watched his parents die in the ensuing attacks, Tom takes refuge in the archeological dig site in Glastonbury Tor. With his enemies closing in, he grabs up a high tech pry bar, but takes a wrong turn in the catacombs and runs into a dead end. Using the pry bar to try and clear the path, he inadvertently opens a crypt, the long sealed resting place of King Arthur Pendragon, son of Uther Pendragon and the Once & Future King of England! Thus begins the further adventures of Arthur, his new found squire Tom, and the Knights of the Round Table- in their reincarnated forms- as they take up arms in this futuristic landscape, to rid England and the entire world of the alien menace. Regrettably, I wasn’t onboard with this series in its original twelve issue run, but I have read the trade paperback multiple times. Giving my worn out old copy a quick thumbing through, I found myself getting caught up in the story all over again, and plan on adding one more read through to my resume’. For fans of science fiction, this story is going to deliver everything you could possibly want. Alien invasions, steadfast rebels fighting for their homes, heroes from all walks of life stepping forward to help the helpless and defend the defenseless. Also for students, and even casual readers of Sir Mallory’s work, I don’t think there’s anything in these pages that will disappoint. 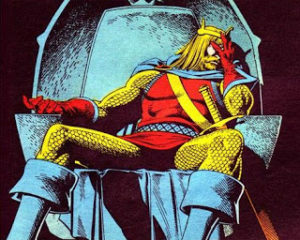 Mike Barr & Brian Bolland credit Dr. Sally Slocum as their “Arthurian Consultant”, and they didn’t shy away from any aspect of the legends, good or bad. As heroic as he is, Arthur remains an incredibly flawed individual, guilty of some pretty horrendous acts committed in defense of his crown. Further, his Knights of the Round Table have carried every pound of baggage with them through the centuries, so it comes as no surprise when Queen Guinevere and Sir Lancelot once again take up their doomed romance. It’s pretty awesome when you can look back at a book that you loved when you were younger, comic or otherwise, and find that it still holds up. I’m not saying that everyone is going to find the same quality in this work as I do. I’m just saying that I’ve looked back at some of the things I read as a kid, and felt more than a little let down. This has not, most thankfully, been one of those times, so I just had to share it.